You should plan to be at one of these auditions times (not both). Callbacks will be held on Saturday, February 11, 11AM to 2PM. We'll contact you via email with information regarding casting, and scheduling for callbacks. Not every actor who auditions will be asked to the callbacks, and casting some parts may not require a callback audition. NOTE: All acting parts in The Music Man are unpaid. A song from a musical with written-out sheet music (please, no charts/lead sheets) in the correct key. An accompanist will be provided. If you have questions about an audition song, contact the musical director (click the link to send email, or call 530-346-3210). You may be asked to read a scene from the show; materials will be available at the audition. IMPORTANT: Please try to limit the length of your audition song to ONE MINUTE or so. Perform the best part of your selected song, and make sure to mark up your music so it's clear where you're starting and stopping. If your song is longer than one minute or so, we may stop you, in order to keep the auditions moving. You will be asked to learn and perform some simple movement, so please dress comfortably, wear shoes appropriate for movement, and be prepared to do some simple dancing! 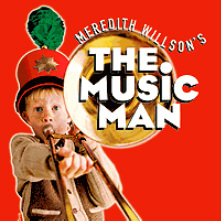 Search for The Music Man on YouTube and you'll find a ton of reference material. Of course, watching the excellent 1962 film will provide good reference content. Rehearsals generally occur on Sundays (5PM to 8PM), and Mondays through Thursdays (6PM to 9PM), starting May 1 2012. You can find a complete plot summary here (click the Synopsis tab). 1. Download and print out the audition form, or download and fill in the audition form in Adobe Acrobat before printing it out. 3. Fill out the audition survey and choose a time. The ingenue, so skilled at playing the stern, judgmental librarian that most of her neighbors don't see the loving, yearning young woman she reveals in "My White Knight." An Irish widow who's all heart. Must have an Irish accent. Looks 40-50 (can be older, but must look young enough to have a 9-year-old child). Likes to tease Winthrop but has a crush on him. Must pretend to play the piano. Age eight or thereabouts. Must be able to sing solo and hold a harmony part with Marian. A definite presence who unbends only when tempted by the opportunity to dance; her woman friends defer to her for good reason. Looks 40-50 (can be older, but must look like she could have a prepubescent daughter). Female dancing lead with some dialogue; late teens (or looks like it). No solo singing, but is part of the chorus. The female counterparts of the barbershop quartet; they both gossip and gush with great enthusiasm and energy. Some small solo singing (and part of the chorus). No solo singing, but part of the chorus. Exasperated, opportunistic; will sell an anvil with the same determination he brings to seducing a girl. No solo singing, but part of the chorus. Actor might have to shave his head. Charming and engaging, can get anyone to like him; such a good con man that even he doesn't realize until the end of the show that he actually cares about the boys' band and the townspeople he meets--especially Marian! Takes himself absolutely seriously, but that's why we laugh at his bluster, self-importance and affectations. Non-singing role, but is part of the chorus. 40 or older. Once they learn how to sing together, they love every gorgeous note of every song! These actors have a few lines, but it's mostly about the barbershop quartet singing. A former rascal gone straight but willing to help Harold with his new con, so he still has a mischievous side. This is a fun comedic role, with a little dancing involved. Male dancing lead with some dialogue; late teens (or looks like it). No solo singing, but part of the chorus. A challenging role; starts out painfully shy but completely comes out of his shell. Must be able to speak with an amazing lisp. Age nine or thereabouts. Needs to have an unchanged boy's voice; sings several solos. With a twinkle in his eye. No solo singing (but is part of the chorus).